I have added Amazon Context Links to my blog. The links will show up with a double underline. This links are automatically added by Amazon, linking from content in my blog to Amazon products for sale. These links provide advertising to help pay for this blog hosting. To add them in WordPress, I first went to the Amazon Associates Central. Their “Context Links” page under “Build Links” page provides an interface for building the snippet of code needed to add Amazon Context Links to the site. I copied this chunk of code to the clipboard. Then, I opened the theme’s footer, which in my case was: wp-content/themes/default/footer.php. I pasted the code right before the <?php wp_footer(); ?> text at the end of the file. That was it. We’ll see how this works. This was the second time that it happened to me. I was checking my bank transactions and noticed that one of the transactions as reported by the bank was $33.28. In my transaction log though, I had recorded $33.08. My bank now provides electronic images of the canceled checks (instead of returning the actual canceled check like they did in the old days). I logged on and looked at the image. Yep, the check was written for $33.08 and “written” for “thirty-three and 08/100”. I sent the bank an email. They responded that they would credit my account $.20. It’s only $.20, but it could have been much more. I am surprised that this doesn’t happen more often. The whole check-writing thing seems a bit archaic, at least to me, a self-proclaimed computer geek, what with the analog (me hand writing a check) to digital (someone/something has to convert it into digital form and enter the transaction amount into a computer) conversion. My bank is Farmers State Bank. Thank you for being quick and courteous. 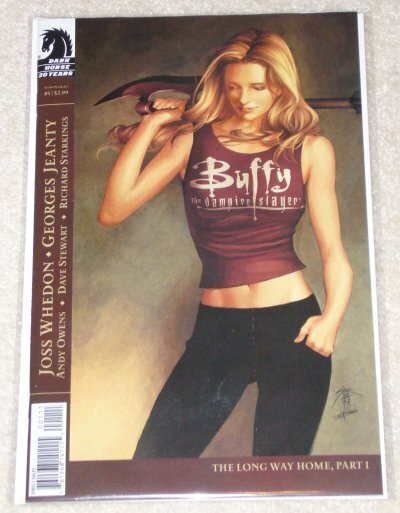 I just finished reading Buffy the Vampire Slayer: Season 8 #1. It picks up right where the TV show ended. The drawings are impressive. The dialog is buffy-esque. I look forward to issue #2. Check it out if you can find a copy. You should be able to. They are already doing a second printing. So I received my copy of Buffy the Vampire Slayer: Season 8 #1 yesterday. I ordered it from TFAW.com. This was the first time that I have ordered from them. The issue was released on March 21, 2007. 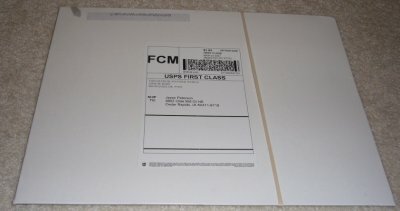 I received an email on March 21, 2007 from TFAW.com informing me that they would be sending me a package with the Buffy issue, bagged and boarded as requested, soon. I received a second email on March 23, 2007 from TFAW.com saying that the Buffy issue was sent. I received the shipment on March 26, 2007. The envelope, a cardboard mailer, arrived in very good shape. It had a rubber band around it. I don’t know why? This was the first time that I have received a comic book in the mail in over 20 years. For $.25 cents extra, TFAW.com “bags and boards” the comic. 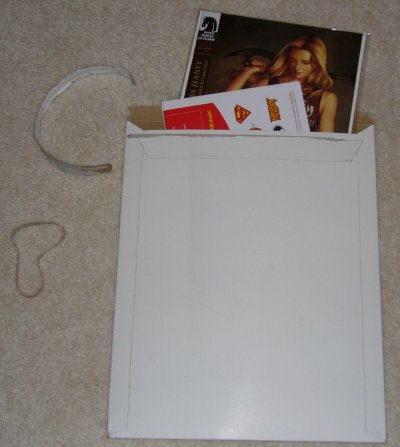 They put a piece of cardboard behind the comic to keep it straight and enclose it in a polypropylene bag. I look forward to reading the issue! I just received my issue of Buffy the Vampire Slayer: Season 8 #1 yesterday. Once I get a chance, I will post an update. Welcome to my new blog. This is my first post! I have had a couple of different sites at the address over the years. I had for a time being focused on home automation using Java. Since then, I have become a father of two children. My focus has therefore shifted. I still do Java programming by day for a living, but my evenings are mostly being “daddy”. I have no idea what this blog will become. I will find out in time. Hopefully, there will some value in it at some point.